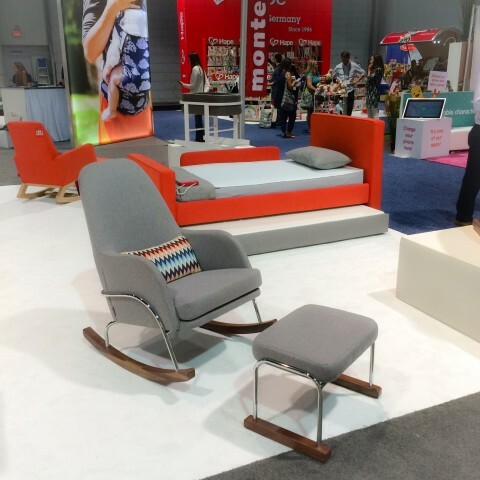 Looking through SISSY + MARLEY‘s portfolio of kids’ spaces, you may notice that they’re long time fans of ducduc, so you may not be surprised to discover their collaboration on an incredible new playroom furniture collection. The showstopper of the collection is the Marley House Closet. The dramatic storage pieces can be customized with different finishes and start at $1700 a piece (three are shown here). 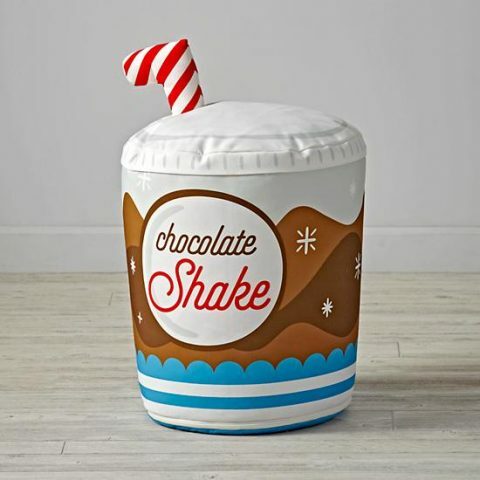 The collection also includes the Myles Desk ($495) Logan Stool ($250), and Jasper Toy Storage ($880 with desk and $385 without). 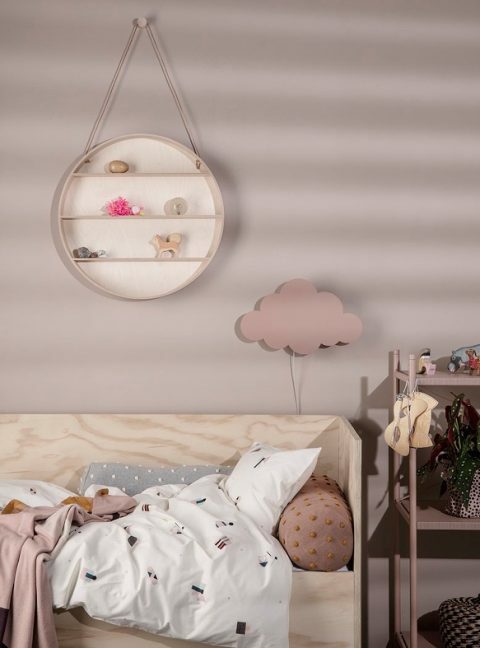 Many of SISSY + MARLEY’s kids rooms feature decorative book displays and I have a feeling they’ll be using their Ryan Book Ledges from now on ($645 for set of 3 classic shelves as shown). 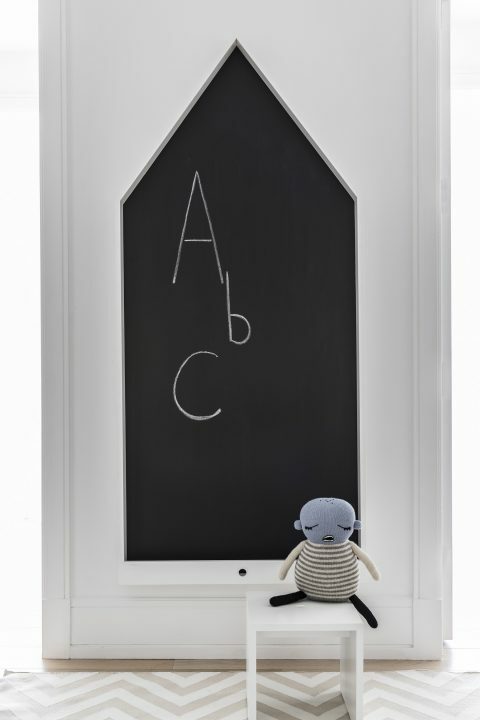 You can also add a little extra fun with the generously sized Sebastian Chalkboard ($725) or the Sebastian Corkboard ($795). 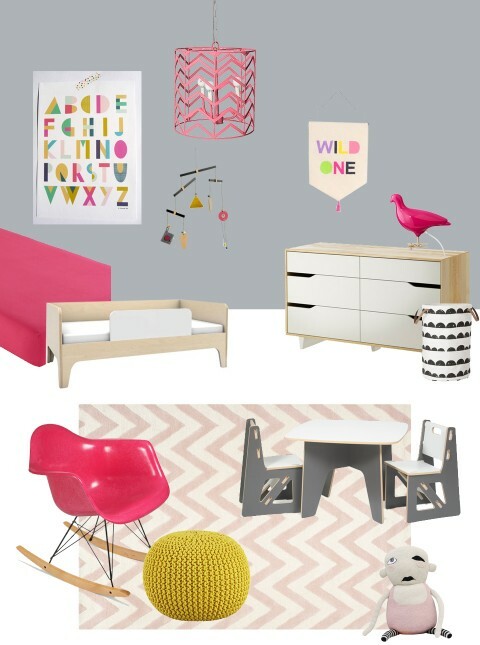 Mix and match these pieces in your space to achieve playroom perfection! 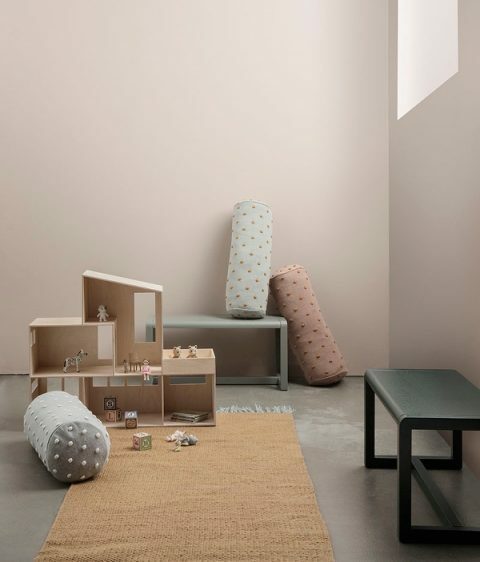 There is so much cool new stuff to show you from Ferm Living’s 2017 Spring/Summer Kids collection. I’ll start with the big stuff, and work my way down from there. 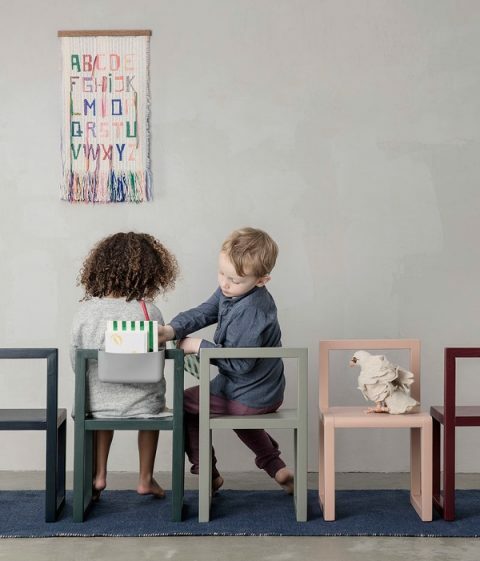 So last year, Ferm Living started to grow beyond home decor into furnishings, and this year the furniture has spread down into the children’s collection! 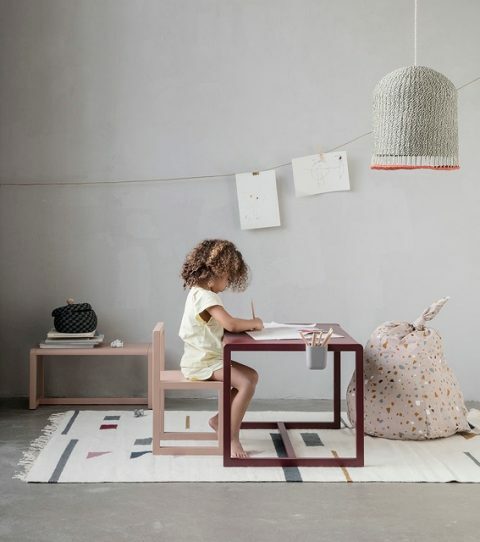 The Little Architect furnishings include a table, chairs, bench, desk and storage pockets (large and small) that attach to the desk or table. In these furniture photos, you can also see the Braided Lampshades (Medium above and Tall below). 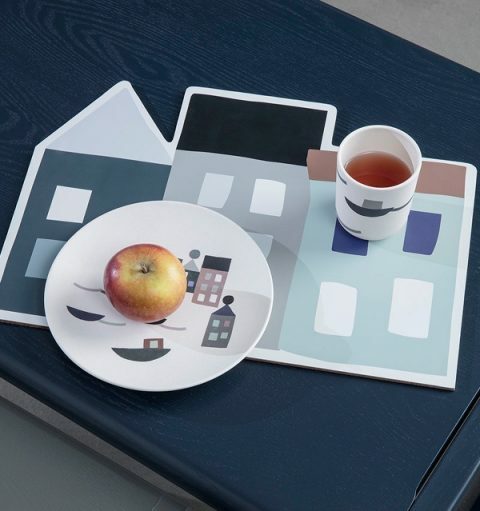 The Little Architect collection comes in 5 muted colors– Bordeaux, Dark Green, Dark Blue, Rose and Gray. Shown with the chairs above is one of my favorite new pieces, the ABC Wall Deco. 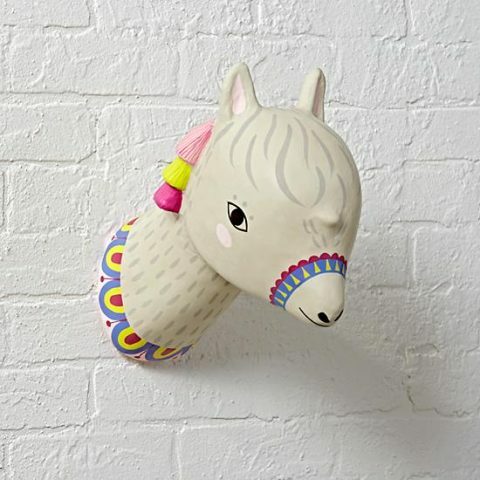 This is the most fun and kid-friendly woven wall hanging I’ve yet come across! 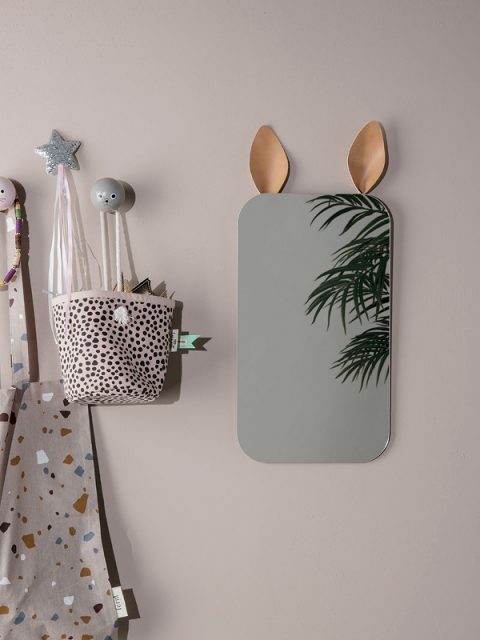 Also perfect for the nursery wall is this adorable Rabbit Mirror! You may also consider the simple hanging Kids Growth Chart. It is available in Rose, Mint and Off-White. 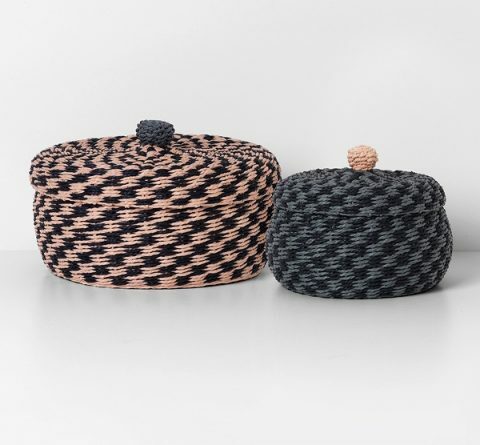 If you like the Braided Lampshades, you’ll love the Braided Baskets as well. I was excited to see the two new wallpaper patterns. Swan comes in Rose and Gray. 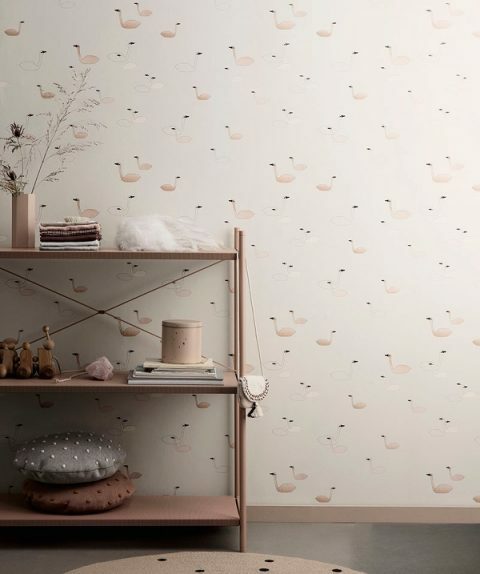 Terrazzo wallpaper is also available in Rose and Gray and can be used well beyond the nursery. 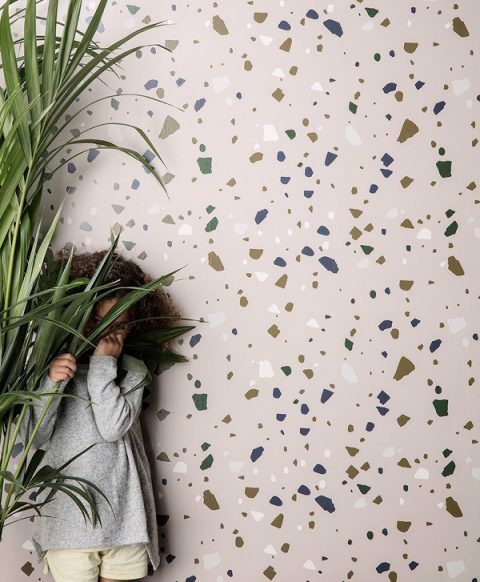 And you thought Terrazzo was just for the floor! 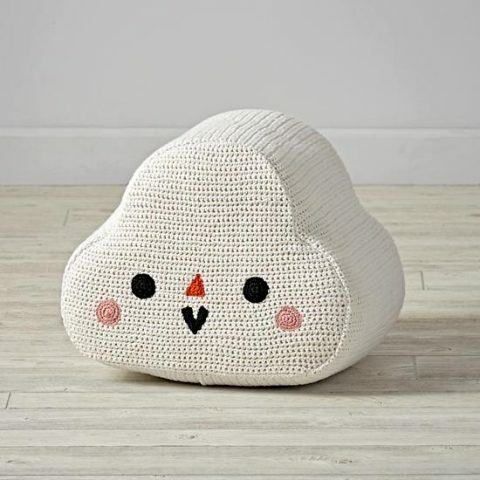 There are lots of cuddly new textiles for spring. 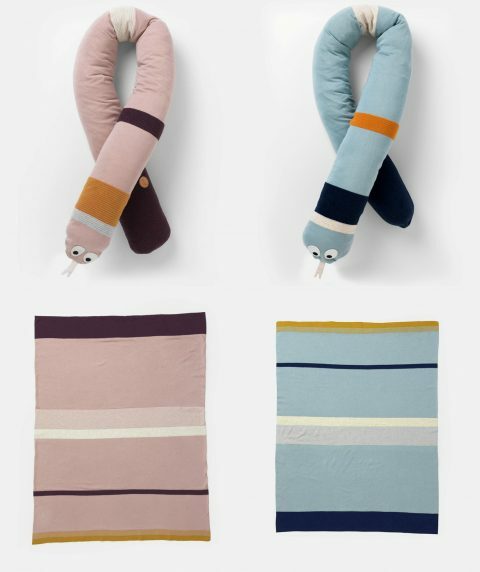 The Stripy Snake (blue, rose) and Blanket (blue, rose) make a perfect pair as decor and are wonderful to give as gifts. 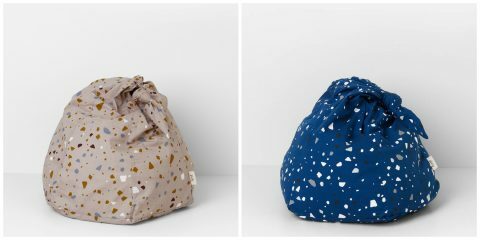 If you like the Terrazzo pattern, you might love the Knot Bean Bag in Terrazzo Rose or Terrazzo Blue. 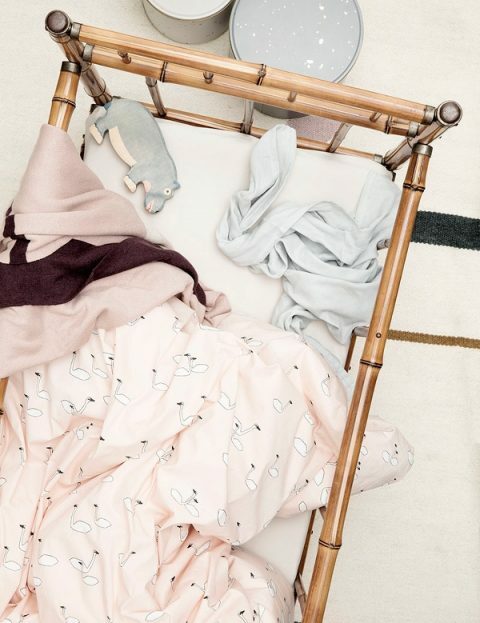 The beautifully textured Popcorn Bolsters (Dusty Rose, Dusty Mint and Gray) and Pillows (Dusty Rose, Dusty Mint and Gray) can be mixed in with any of the new kids bedding. And speaking of bedding, last season’s Seaside and Party patterns are now available as bedding. 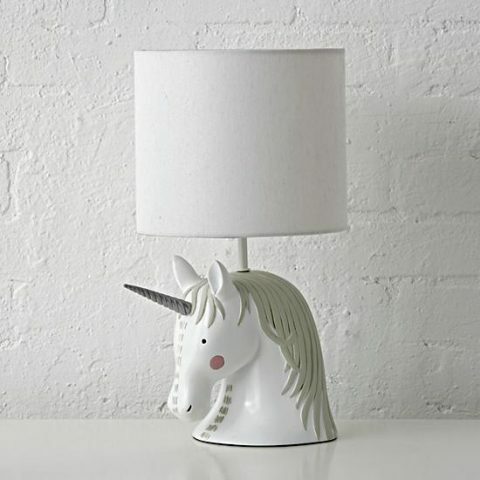 Check out the Cloud Lamp in Dusty Rose as well. 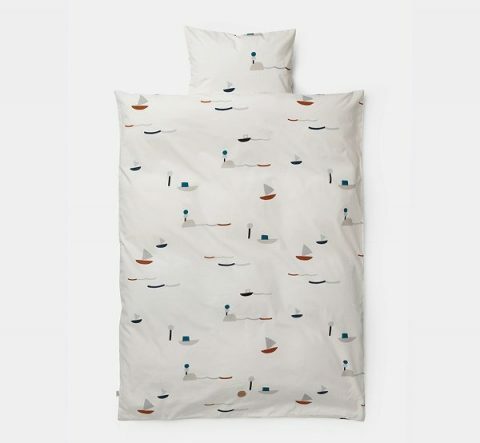 If you love the Swan pattern, it comes in bedding as well! Choose the Rose or the Gray. There are also more neutral Milkyway bedding patterns in Rose and Cream as well as solid color bedding that can be mixed in with your favorite patterns or used on their own. 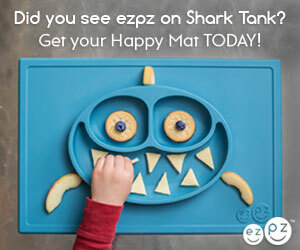 and Party Dinner Mats. 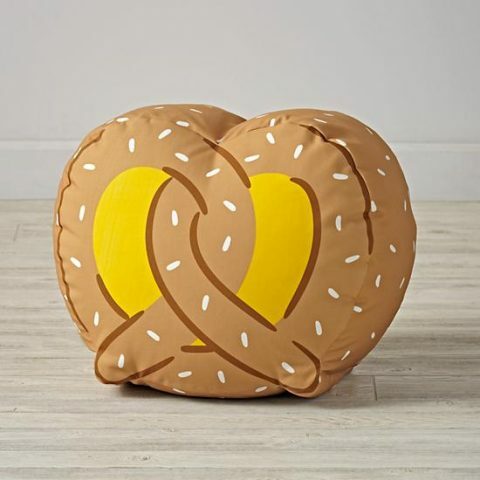 These really round out the sets. The new collection won’t be available until March and ships worldwide via their website. 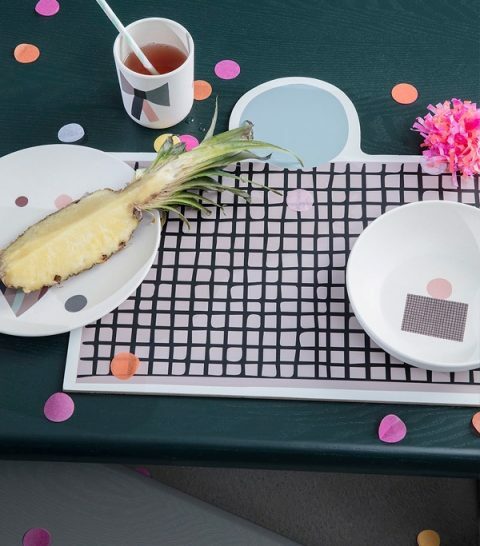 If you wait a little longer, you’ll find the pieces for US ordering on Clever Spaces. 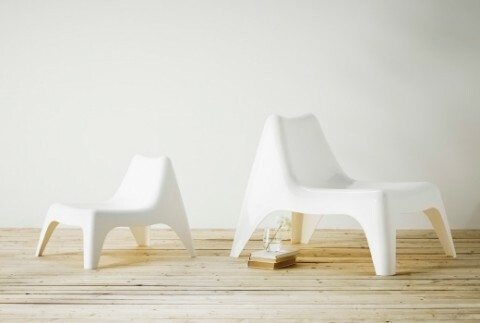 I’ve loved P’kolino’s Little Reader chairs for many years but these are the most interesting versions yet. 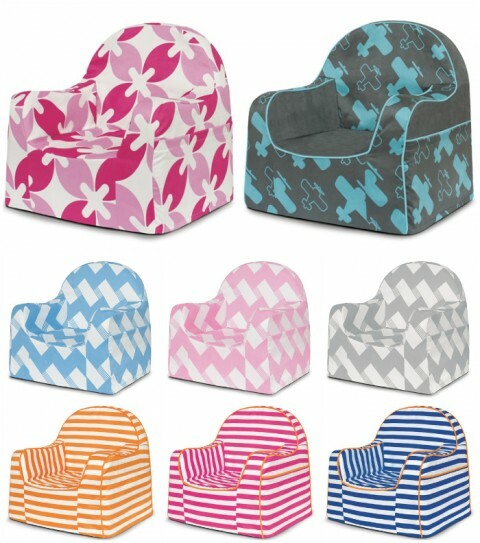 Check out the Little Reader Special Edition Chairs! These are each $200. I’m not sure why they are $140 more than the regular Little Readers, but they are pretty. 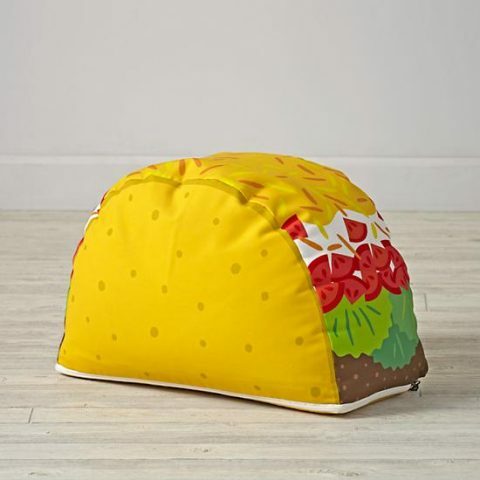 Sometimes all your space needs is one bold, fun accessory that really makes a colorful statement. 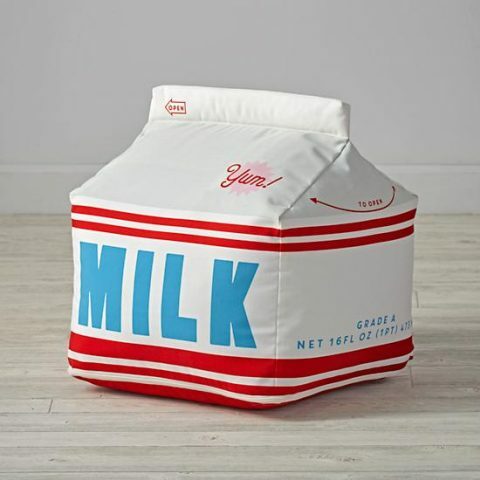 The Land of Nod has no shortage of these and these are my new favorites for 2016.
or just the plain Milk Carton Pouf. 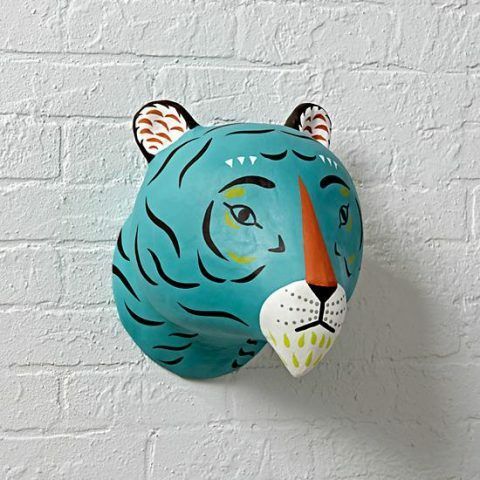 Another incredible new tiger is this paper mache faux taxidermy piece by Sarah Walsh. Or you may like the alpaca instead! 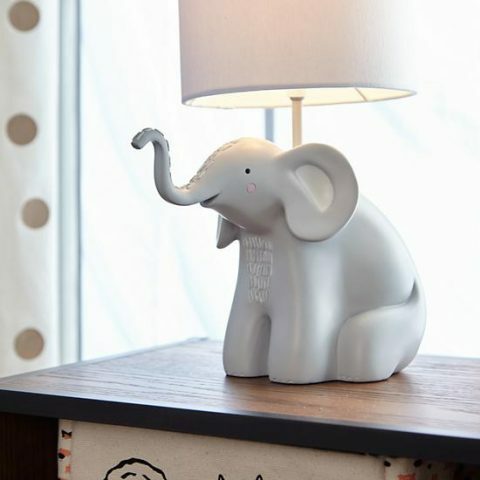 Elephant Table Lamp can add some friendly fun to an otherwise neutral, sophisticated room. I just can’t get over all the cuteness. 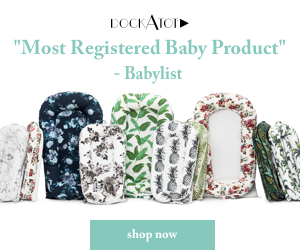 Last year we went nuts for Monte‘s Rockwell Bassinet and this year they followed it up with the coordinating rocker, the Jackson Rocker! This should be available at the end of January and will retail for about $1200. 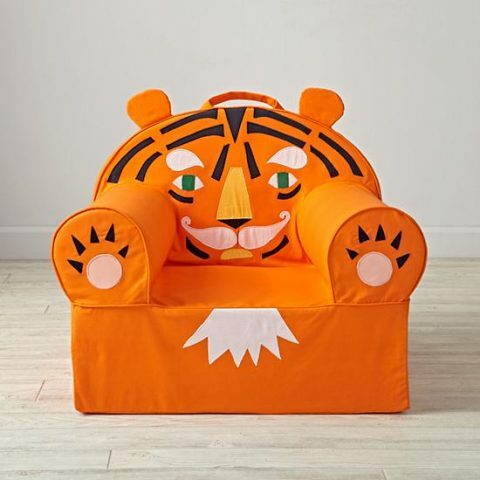 Monte’s other new debut is the Opie toddler chair. 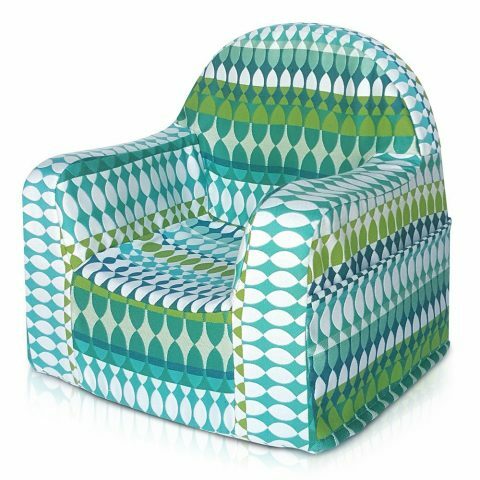 These are the perfect kids chairs for your modern living space and I’m envious of anyone who has children small enough to enjoy these! 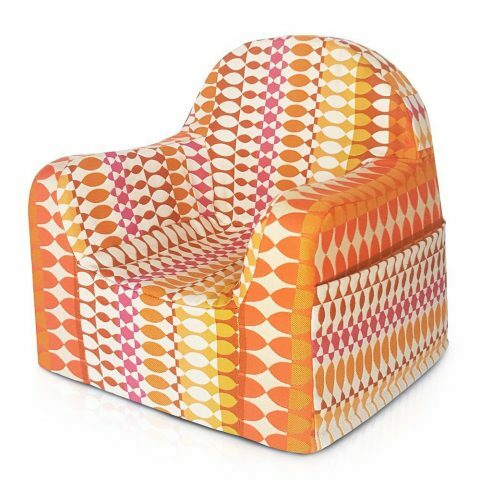 The Opie chair will retail for about $300 and should be available before the holidays. Suitable indoors and out, Ikea’s BUNSÖ is the mini version of the PS VÅGÖ. 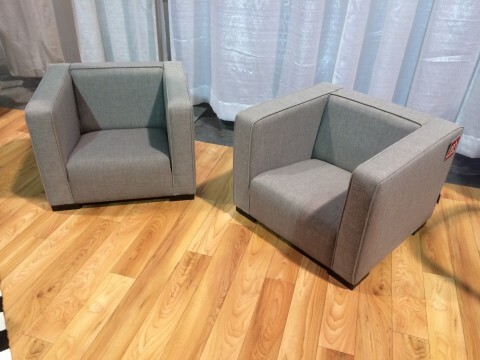 They are remarkably comfortable, and for $15 and $30, won’t have to sit on your wishlist long. Get to your local Ikea ASAP because after the summer, there’s usually less outdoor stuff in stock (if any at all). They are also both available in red and green. In my son’s toddler room, he had a bed, a bookcase and a play table with chairs. While I bemoaned the constant pile of crafts and activities that cluttered the table top, for him, the play table was his home base. Half-built Lego sets and nearly finished comic strips waited patiently for him, undisturbed by tidying in other parts of the house. 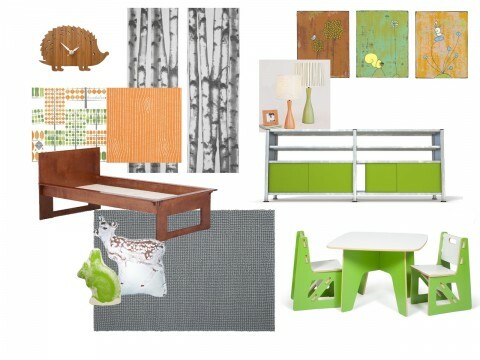 When I put together my nursery inspiration boards, I don’t usually have the room to add a play table and chairs. 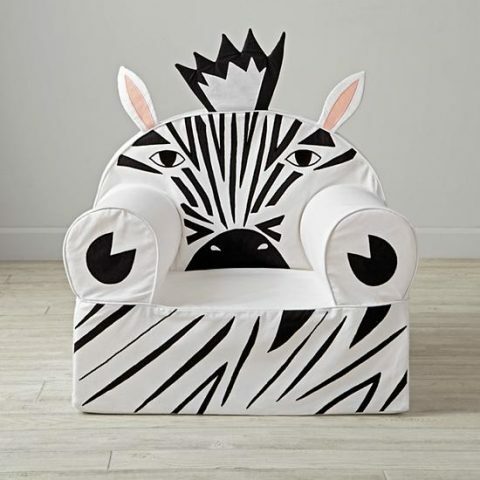 While this is fine for a baby’s nursery, once that baby becomes a toddler, the table and chair set might become more of a priority. It’s easy to update a nursery for the toddler years, and today we’re going to fit a little play space into some of our favorite nurseries. 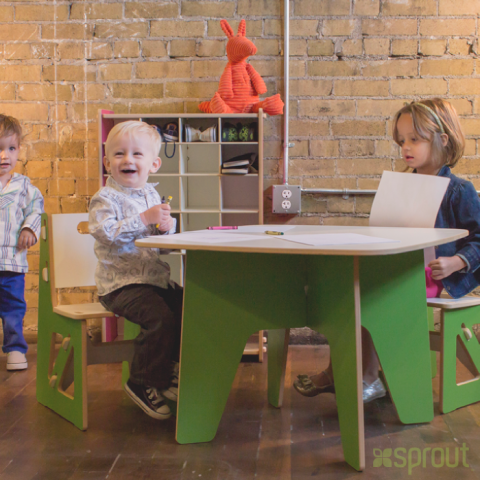 The Sprout Modern Kids Table and Chairs are easy to assemble in just a couple minutes with tension lock tool-less technology. The table-top is spacious and both table and chairs can hold up to 150 pounds. 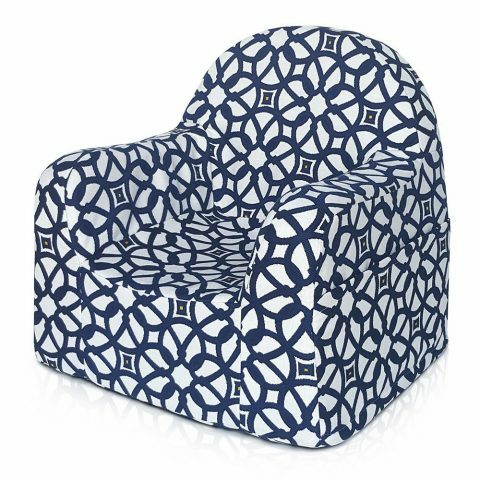 They are made in the USA from recycled pre-consumer fiber and come in several fun modern colors which make them perfect options to customize your growing toddler’s space! 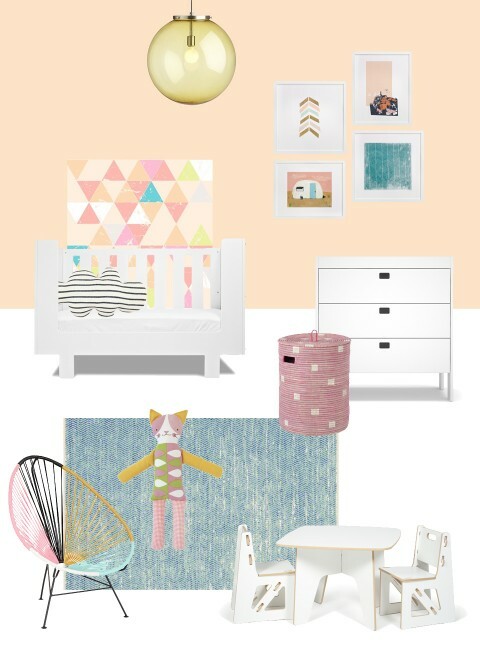 Here, My Modern Nursery 84 has been updated for toddlerhood with a Perch Toddler bed and Sprout’s Modern Kids Table and Chairs in Slate Grey. 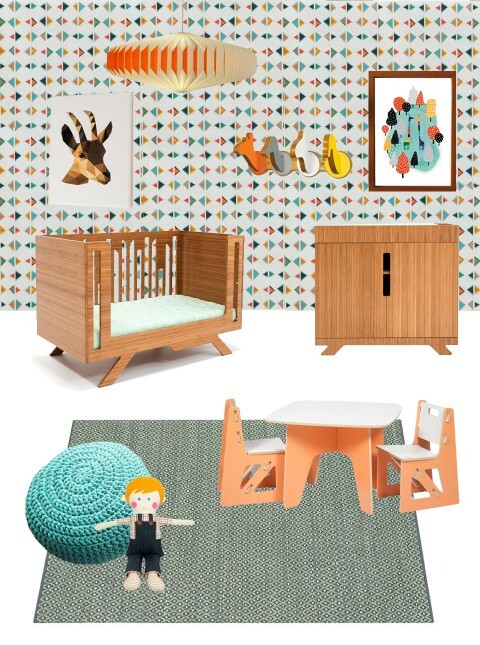 My Modern Nursery 94 got the Wired Crib Conversion from NUMI NUMI Design and the Modern Kids Table and Chairs in Orange. In My Modern Nursery 81, the Eicho Crib Conversion and Modern Kids Table and Chairs in White keep the room light, bright and open. Finally, I’ve gone way back to My Modern Nursery 8 with the Modern Kids Table and Chairs in Green. 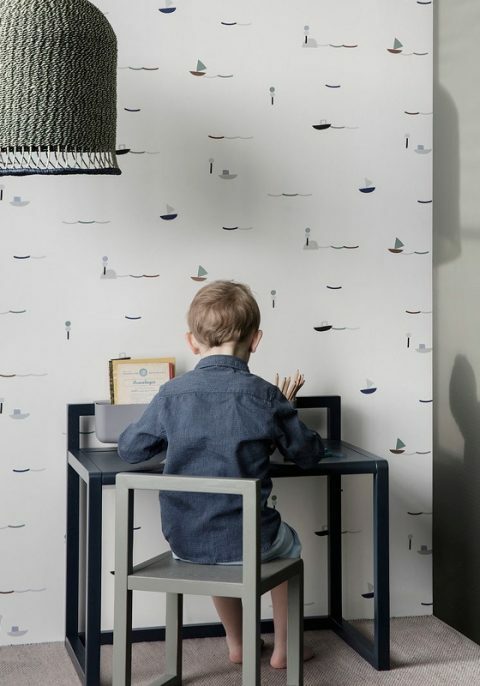 This was my inspiration for my own son’s room and Sprout would have been perfect there! 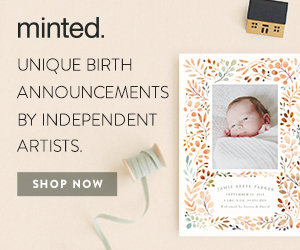 Thanks to Sprout for sponsoring this post and giving me the opportunity to revisit some older designs and show them updated for the toddler years. It’s amazing how quickly your little ones grow up, but the Modern Kids Table and Chairs will last you until their pre-tweens. 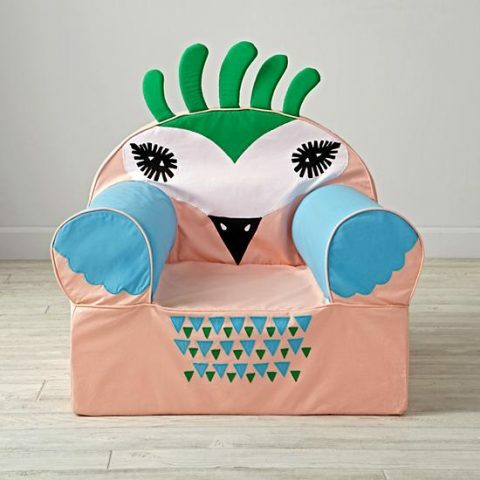 P’kolino’s Little Reader was already one of my favorite chairs for toddlers and preschoolers, but now they’re even more attractive with these patterned chair covers. The new patterns include Pink Leaves, Blue Planes, Grey, Pink and Blue Chevron, and Orange, Pink and Blue Stripes. 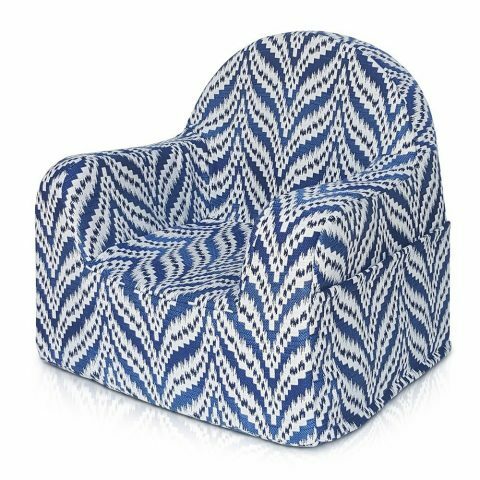 You can purchase the chair with cover for $70 or you can purchase a cover for the chair you already own for $25.